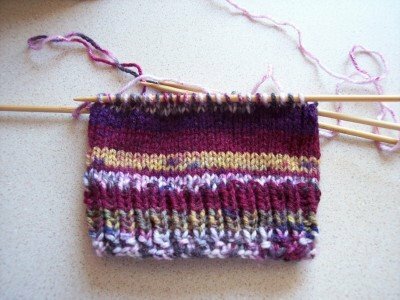 WELL......since I have no pictures to post of my knitting....(it is too sad...didn't want to depress anyone!). I thought I would post this picture.....as this is pretty much all I have of my socks....a couple of balls of yarn and my sticks!! 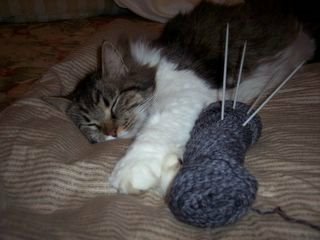 I have ripped and re-knit the infamous socks so MANY, MANY times my Wildefoote yarn is in shambles....shredded as if ripped by wild animals!! After some encouraging words from Emily (a.k.a. yarn miracle, did I also mention I don't know how to add links? ).....I am not giving up!! Besides.....it is a matter of PRIDE.....my DH upon seeing me pull out my knitting seems to take great delight in asking me...."oh...is that another pair of socks you are knitting? ".....knowing FULL well by the many "knit fits" I have thrown it is STILL the same pair!!!! I think I'll knit him some really "colorful" socks (he's color blind)....then hide all his other socks, forcing him to wear them to work as punishment....Hee! Hee! Hee! Ah...revenge is SWEET!!!!! I feel empowered already!!!! 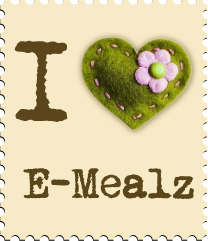 I can't say enough about Emily.....how kind she has been to this fumbling beginner!!! We have shared many "knitting consultations" not to mention all her encourgement!!! I was able to get to the YS to have my vest pattern written out....so at least that is one positive thing.....oh....and I am working on a baby blanket.....so maybe things aren't so bad after all!! Hope to have the weekend free to knit and hopefully have something worthy of posting Monday! O.K. Valuable lesson learned.....SIZE DOES MATTER!!! I'm happily knitting along on my sock....to the point of beginning the heel, checked with my knitting mentor and sock queen Emily to be sure I'm on the right track. I decide before I start the heel that I can't stand it another minute....I just HAVE to try on what I have to see how STUNNING it is going to look when I am finished! WELL......much to my dismay I discover that while I did use the size needle stated on the pattern that apparently my gauge is off by one stitch resulting in a sock top that is WAY too big!!! So here we go again with the ripping!! DH that he is suggested that perhaps I should have waited on buying sock yarn until I had actually completed a sock!! So I poked him with one of my LOVELY double point needles!! Hee! Hee! I reminded him that the things we work for the hardest in life are the most appreciated and MAN am I ever going to appreciate these socks.....One of the Days!!! I'll not post a picture of what I have....not worth getting the camera out. Oh well.....today is another day and hopefully I'll get enough knitted this weekend to have something worthy of a picture on Monday. I guess it is all a learning process....but I think with the tiny yarn I will need the bamboo for a measure of control and on the thicker yarn such as this I will definitely use the aluminum so I can work with it easier!!! Is there a Cliff's Notes for Knitting out there somewhere?????? Happy, Happy, Joy, Joy......look what the UPS fairy just delivered!!!! I can just SEEEEE the socks....can't you? (I know I haven't got a single sock finished to date......but I have got a million of them in my mind)! If I can just find enough time to make a single pair I'll be a happy girl! Now to the real dilemma.....do I add this to my yarn stash or must I start a SOCK yarn stash? Oh dear...where to stash my NEW stash???? 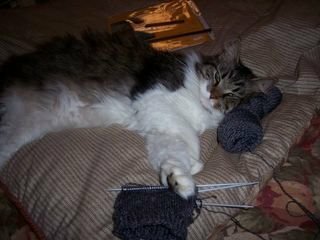 Gracie was TOTALLY not getting into the sock part....however she rolled the skein around till she got it fixed JUST RIGHT!!!! After all.....it IS all about her highness's comfort!! (Check comments below). Despite the fact that the sticks look sort of like needles in a voodoo doll I promise it isn't!! (Although come to think of it wonder why I didn't think of that sooner!! LOL!). I feel like I FINALLY got the hang of this sock business....(at least as far as the top of the sock goes)....when I took a good look at it there were just too many mistakes that I had made and while I know my first sock isn't going to be perfect.....I would prefer that the mistakes be ones that only I would be able to see......SO.........out it came!!! I almost cried!!!! 326 hours of work (well....maybe not QUITE that many! )....and out it came in about 2.4 seconds!!!! BUT......I am picking it right back up and will hopefully have a cuff to post in the next few days. 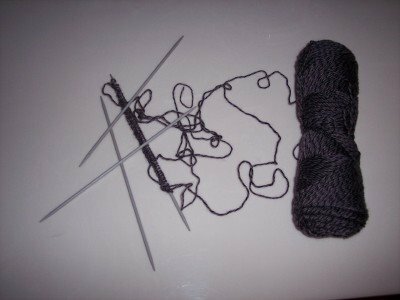 Work is still and issue for me right now so I am limited on time to knit....of course another problem I have is checking out all the blogs!! Oh....I fear I have created another addiction!! Working on a way to "flash my stash".....I feel the need to come clean about this. 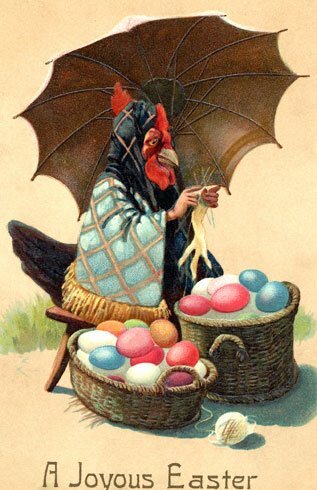 Will try to think creatively....may take me awhile.....Hee Hee!! 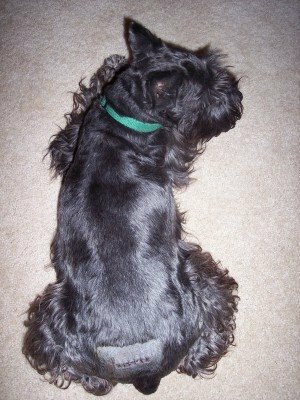 My Poor Max.....had a fatty tumor that popped up on his back and had to be removed. Max, no stranger to the vet (we are personally responsible for my vet's new beach home).....threw his usual....Dear-God-In-Heaven-Don't-Leave-Me-Here-How-Could-You-Do-This-To-Me.....throw down fit when I had to leave!! It always breaks my heart to leave him...he HATES the Vet!! Can you say $200??? Max and I BOTH say OUCH!!!!! O.K. So you take two evenings.....total about 4 hours...and what do you have??? ONE ROW!!!! It was a fight, we wrestled back and forth but I think I won this round!!! I guess I need to stick to "mindless" knitting when I am this tired!! I am not working tonight...Chicks With Sticks meet tonight! YEA!!!!! Looking forward to sitting around with my knitting buddies and enjoying time spent with good friends and having time to knit!! 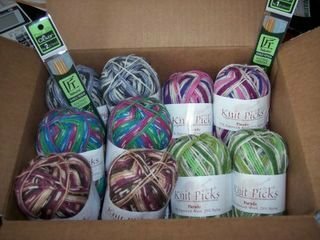 I may not have had time to knit at night much these past few nights but while working I have managed to order oh.....I think it was 8 or 10 skeins of yarn for socks!! I thought positive thinking here by ordering yarn for my future socks would be a good thing! Don't you think? Isn't ANY excuse you can come up to buy yarn a good one??? Also have some patterns on hold at Knit Nouveau and I just KNOW they will have some sock yarn there to temp me!!! Just not sure when I'll be able to get away!! I also ordered bamboo needles and can't wait to receive them! I am really struggling with keeping this slinky thin yarn in control with these slick needles!! Hoping the bamboo will give me a measure of control. I can tell I love the feel of the aluminum and I am sure once I get used to working with them and the smaller sock yarn I will most likely be glad I have them! WELL......I'm down but not out!! After three and a half hours of work last night I am back to my original 64 cast on stithes. I think I ripped out 10 times!! For SOME reason I could NOT get the little bugger joined without losing a stitch! 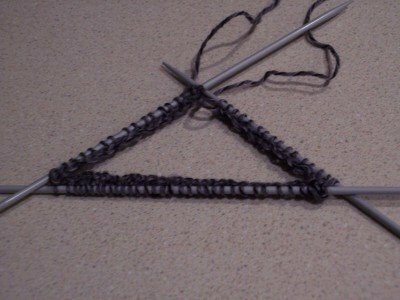 At one point I DID have all 64 stitches (not sure how this happened).....actually knitted 3 rows but discovered I had let the joined area slip and I had a big gap that I wasn't able to pull together.....I believe this was rip out number 7 or was it 8.....but I digress. I am going to try to run out to the LYS today and have someone show me the proper way to join...I KNOW I am going to feel like a complete IDIOT when they show me! I guess I am just too tired right now! (That's my excuse and I'm sticking with it!) LOL!! Oh....and did I mention I couldn't find bamboo needles which is all I have ever used and had to buy aluminum? Can you say wet spaghetti......GREASED???? I'll definitely be ordering bamboo needles to use for the next pair of socks I knit, (note: I DID say NEXT pair! ).....I R.E.F.U.S.E. to let a tiny ball of string and sticks get the best of me!!! So Watch out stringy yarn and slick needles......I'll pick you up again soon and knit you till you are tight, composed and no one will EVER guess you were just a ball of slinky, stringy mess!!!! I feel SOOOOOO much better!!! 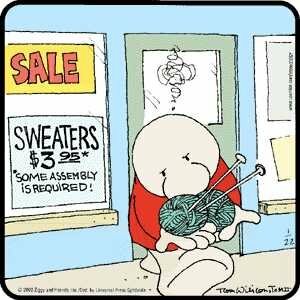 Nothing like a good "knit fit" to get your frustrations and hostilities out! LOL!!!! 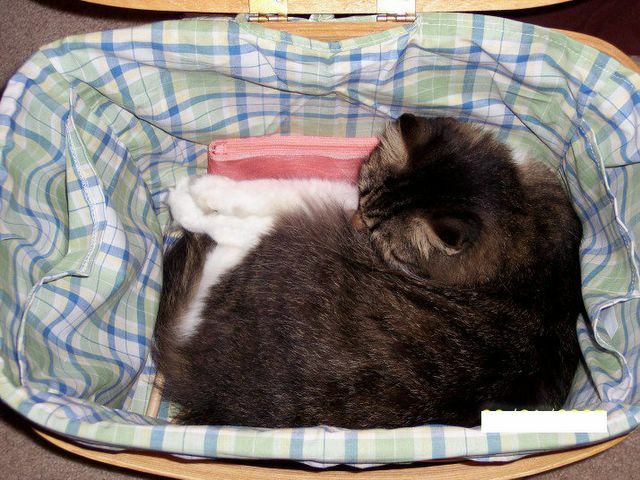 Glad SOMEONE was able to get into my knitting basket this weekend!!! Worked all weekend, hope to get some knitting time in this week. My mother (computer guru) created something I was going to post on April 1st....but I was caught up with work and didn't realize I had completely missed the date! Oh well.....ready for next year!